Combine this with your Tander Paint Cup to create a smart paint application system. Ready to apply paint in two simple steps. 1. Mix your paint in the Tander Paint Cup. 2. Click on the Tander Paint Application Lid and it is ready to apply. Single use only! ; Do not close the nozzle of the spray gun with your finger to improve a smooth flow. The system might explode! ; Maximum 4 Bar / 58 PSI. Use in combination with the Advanced Paint Stirrer for optimum results! ; Attach your Paint Application Lid dispenser box to the wall at working height with the Wall Bracket! Suitable for Spray Gun brand A matching adapter is available for most types of Spray Guns. Trouble finding a matching adapter? Please contact us! Can I use the Paint Application Lid with other types of mixing cups and/or paint cups? 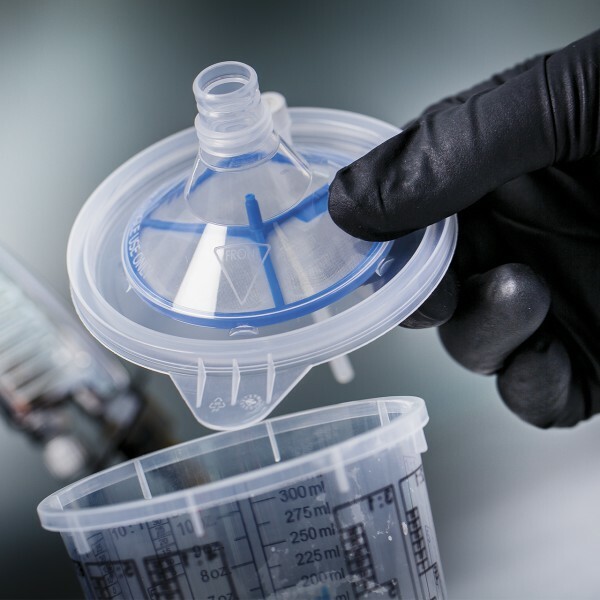 No, the Paint Application Lids are intended to use in combination with the Tander Paint Cups. A working application system cannot be guaranteed while combining the lid with a paint cup or mixing cup from an other brand. Can I use the Paint Application Lid multiple times? No, the lids are intended for single use only. Is the Paint Application Lid available in different sizes? Yes, the Paint Application Lid is available in a 700 ml version for the bigger jobs.